In Early 2013 Irving Shipbuilding started a $300 million modernization of the Halifax Shipyard to accommodate the building of Canada’s newest fleet of naval vessels for the federal government. The scope of work included the demolition of the existing infrastructure at Pier 6 and the installation of a new HZ SSP wall system consisting of a substantial number of 1000mm diameter king piles with a pair of sheet piles between each king pile. EastPoint assisted with the demolition of the existing infrastructure by developing a demolition plan that was safe and completed the work months ahead of schedule. EastPoint assisted with the installation of the new seawall with the design of a pile driving frame that not only was capable of positioning the 1000mm diameter pipe piles but would also allow the drilling company, Birmingham, to index the custom flying lead system for the BHD-40 drill. EastPoint’s project manager, Bruce Tuck, MBA, P.Eng. 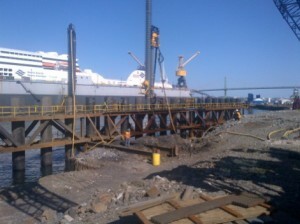 developed the Pier 6 demolition procedures, was responsible for the design of the pile driving template and assisted with the project throughout the demolition and seawall driving stages. Irving Equipment’s Project Manager, Andrew Folkins, P.Eng. was extremely satisfied with EastPoint’s work on both aspects of the scope of work and EastPoint is pleased with the relationship with Irving Equipment and look forward to projects in the future.